The Seahawks on Wednesday re-signed fullback Brandon Cottom, who missed last season with an Achilles injury. The Seahawks have re-signed fullback Brandon Cottom, who has also been used as a tight end, according to a tweet from Cottom. Cottom, who played at Purdue, first signed with the Seahawks in 2015. He was on Seattle’s practice squad at the end of the 2015 season and re-signed in 2016. Used as both a fullback and tight end, he was moved full-time to fullback last training camp and appeared to be making a legit run at a roster spot when he suffered an Achilles tendon injury and was placed on Injured Reserve. Cottom then became an Exclusive Rights Free Agent following the 2016 season but was not tendered a contract by the team, becoming an unrestricted free agent. But now he’s back, one of three apparent fullbacks on the roster joining Malcolm Johnson — who was on the practice squad most of last season and re-signed in January — and Algernon Brown of BYU, who it has been reported has agreed to terms with the Seahawks to sign as an undrafted free agent (as of Wednesday afternoon the Seahawks had yet to officially announce their UDFA signings). The signings this week of QB Jake Heaps and Cottom give Seattle 89 players on their roster before counting any of the UDFA signings. Teams can have a maximum of 90 on their training camp roster, so the Seahawks will obviously have some moves to make at some point to fit in all the reported UDFAs. Cottom also gives Seattle 13 players listed as running backs — 11 tailbacks and two fullbacks — before counting any of the UDFAs (such as Brown). 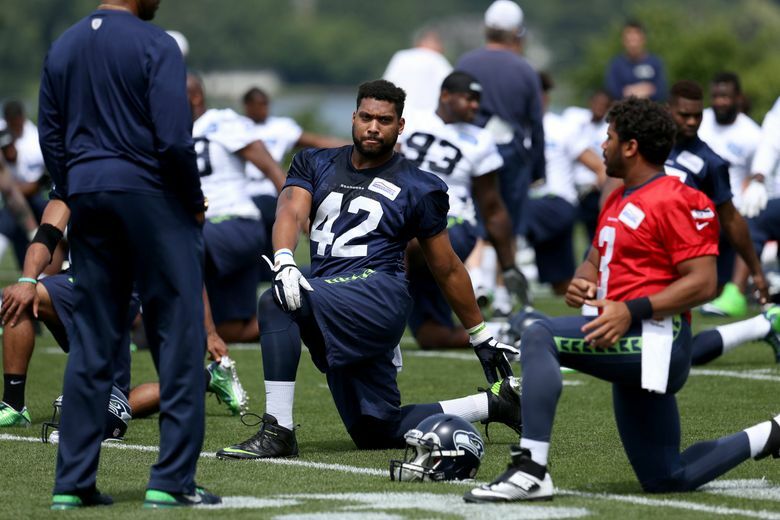 Cottom’s injury was part of a revolving door at fullback for Seattle last season, in which veterans Will Tukuafu and Marcel Reece ultimately ended up playing most of the snaps. Both, though, are free agents and remain unsigned.